There always seems to be a lot of backlash and fuss going around the Internet about how much personal information is shared between my social networks and other sites or services. It occurred to me, though: what if the opposite happened, and rather than too much data being shared you went to visit Facebook or Twitter and all of your data was gone? Having the personal events, photos, thoughts, updates, and video clips I intended to share with only my 500 closest friends (and maybe their friends as well) propagated out to others without my explicit consent is certainly frowned upon. But, personally I would be significantly more upset if all of that stuff just disappeared. For many people toward the novice end of the tech spectrum Facebook is the Internet. It is the sum total of their entire online lives. It is the only repository of precious photos and video clips of birthday parties and other family events. It is their contact database, and primary means of communicating with others. But, there is no guarantee that your data won’t be corrupted or inadvertently deleted, and then what? Facebook lets you archive your social network data, but it is a manual process. 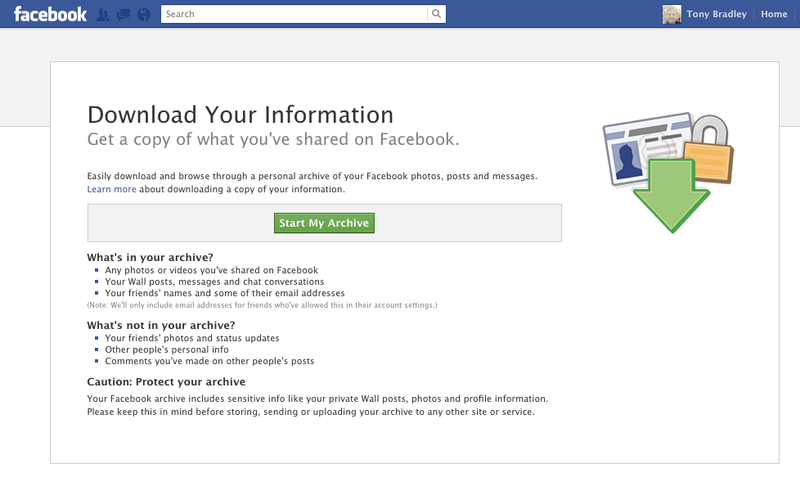 Thankfully, Facebook lets you download an archive of your entire Facebook profile. Go to Account Settings, and then click on General in the left pane. At the bottom of the General Account Settings you will see a link labeled “Download a copy of your Facebook data.” Click it, and you will start the archive process. Facebook will send you an email when the archive is ready. The Facebook archive contains any photos and videos you have shared on Facebook, your wall posts, messages, and Facebook chats, and the list of your Facebook friends and their email addresses. Facebook cautions that you protect the archive once you download it since it contains a lot of potentially sensitive information in a single file. There are two problems with this approach, though. First, it is Facebook-centric and doesn’t help you backup or protect your online data from other services like Twitter or LinkedIn. Second, it is a manual process that requires that you remember to periodically pop into the Facebook settings to get an updated archive. Enter Backupify. Backupify is a cloud-based backup service that automates the process of backing up my online identities. It offers a variety of social media backup plans that can store all of your data from Gmail, Facebook, Twitter, Zoho, Picasa, LinkedIn, and more. The Personal plan is free, but it is limited to only three social media accounts. It also has a 1GB cap on the data, and it only backs up the data once a week. For $5 per month you can subscribe to the MyCloud 100 plan which bumps you up to five social media accounts, 10GB of data, and nightly backups. There is also a MyCloud 500 plan for real social media warriors. That plan allows for 25 social media accounts, and has a 50GB storage capacity, with nightly backups for $20 per month. I am using the Backupify Personal plan right now. But, between my personal Facebook profile, my Facebook Page, Twitter, LinkedIn, and Gmail, I actually have five accounts I’d like to protect, and I would prefer to have nightly backups rather than weekly. I’ll be upgrading to the MyCloud 100 plan soon. As I have ventured deeper into the cloud during the 30 Days With the Cloud series I have been both impressed and concerned with the amount of data and information I have online. Using services like these at least give me some peace of mind that I have my data to fall back on in the event that some catastrophe wipes out my online existence.